LINKIN PARK‘s tribute concert to the band’s late frontman Chester Bennington was live streamed for free via YouTube and can now be seen in its entirety below. The performance itself took place Friday night (October 27) at the Hollywood Bowl in Los Angeles and saw LINKIN PARK return to the stage for the first time since Bennington took his own life this past July. 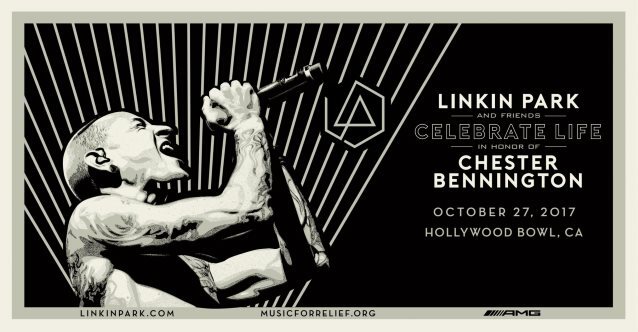 Proceeds from the concert, which was billed as “Linkin Park And Friends Celebrate Life In Honor Of Chester Bennington”, will go to Music For Relief‘s One More Light Fund in memory of Bennington. Among the artists that appeared at the show were Jonathan Davis of KORN, Oliver Sykes from BRING ME THE HORIZON, M. Shadows and Synyster Gates from AVENGED SEVENFOLD, all the members of SYSTEM OF A DOWN except Serj Tankian, members of BLINK-182, Machine Gun Kelly, ex-YELLOWCARD singer Ryan Key, pop singer and LINKIN PARK collaborator Kiiara and more. One of the most memorable moments of the evening was a spine-tingling rendition of LINKIN PARK‘s 2001 track “In The End”, which saw the band encourage fans to sing Bennington‘s vocal part. She continued: “Two of the things that brought Chester the most joy in life were spending time with his family and doing whatever he could to help others. He was incredibly proud of the work done through Music For Relief — he knew it saved lives. And saving lives is exactly what we plan to do in Chester‘s memory. Bennington was found dead on July 20 after committing suicide at his home in Palo Verdes Estates, California.